Banana-que is another popular Pinoy Street Food, it is deep fried saba with caramelized sugar coating in bamboo skewer. Don’t be confused by the name, this is no barbecue, it is deep fried. That skewer stick is just for the handling and for ease of serving and eating. Filipinos just coined the term on the basis that banana-que is on a stick similar to barbecue. I like the caramelized sugar coating and skin of my banana-que, crispy and succulent inside. To attain these the banana is to be deep fried on high heat until color changes to golden brown, then the sugar can be sprinkled while stirring occasionally. And when the sugar start to melt and infuse to the banana removed from heat. Do not over cook the sugar otherwise you end up with sticky coating. 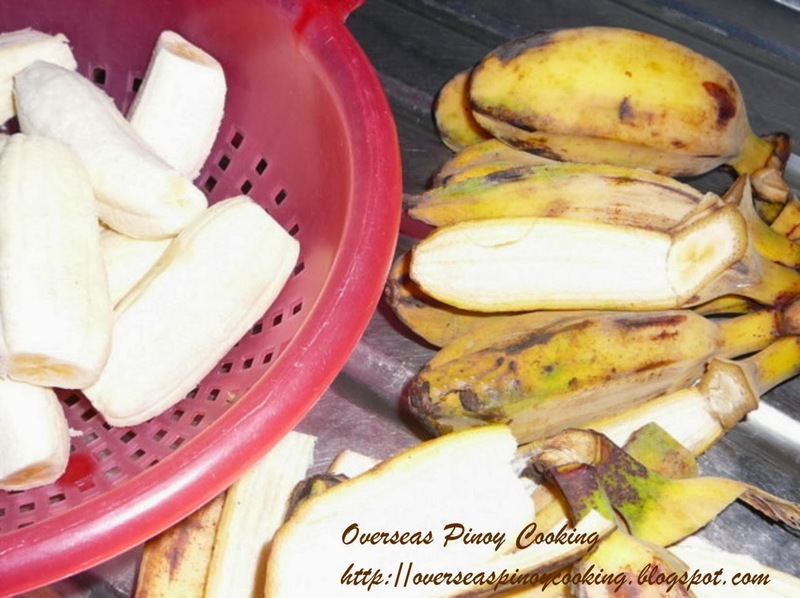 Here's how to cook Banana-que. 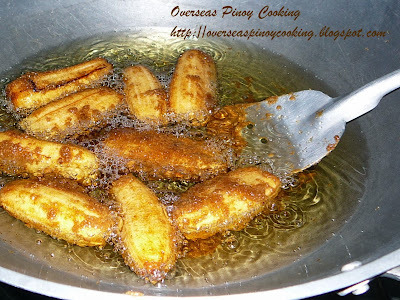 Sprinkle brown sugar over the bananas and continue to fry and stirring occasionally for 2-3 minutes or until sugar has melted and have infused to the bananas. Do not overcook, remove bananas from wok and drain excess oil. Using large bamboo skewer string 2 bananas together. I haven't been to the Philippines in 20 years but this post just brought back a tsunami of memories. Thank you. 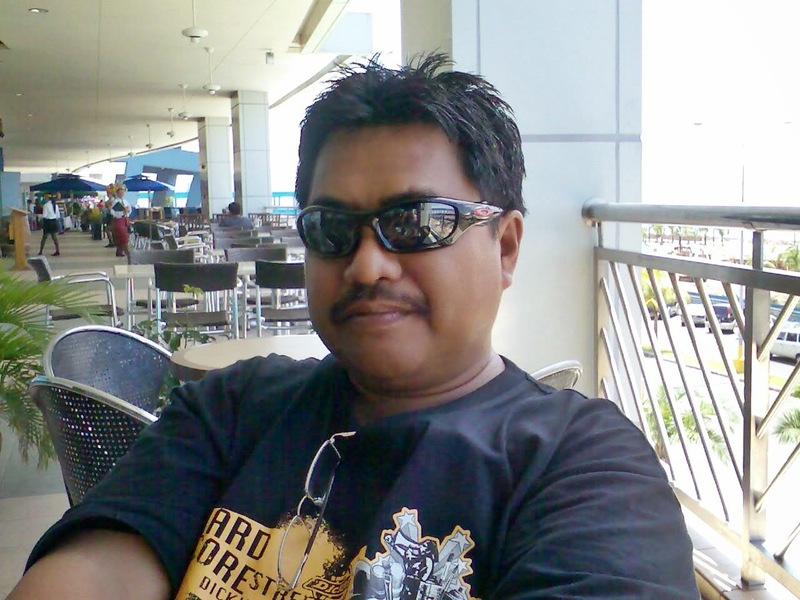 Lonely Noose, Wow twenty years surely you missed a lot of the Philippines. I am pleased my recipe and foods has rekindled your treasured memories. Thanks you sa tips,You are right I made my own banana que palagi sticky kasi overcooked nga.Thanks! how can this be made in a healthy way? we are watching our cholesterol level. can this be baked instead of fried? I live in Oklahoma and I just found a good kooking saba at our new Asian market and wanted to make some banana que. so I will try it I hope it will taste like home. do you have Tamales Pampanga recipe? I don’t have, probably I will make one in the future. DOES IT HAVE ANY EFFECT IF WE'RE GOING TO IT BANANA QUE EVERYDAY???? 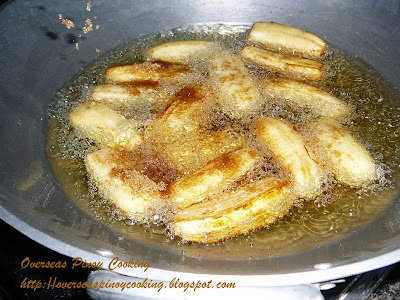 I just sprinkle the sugar while it is boiling, when it starts to melt and coats the kamote or banana sprinkle more sugar then remove from the frying pan. There's nothing like a good o'l bananaque when you're just about to take a long bus ride in the philippines. such a wonderful/tasty little thing. I am a half filipina and my mom is full but soo Americanized she can't speak Tagalog or Ilocano. My grandma didn't pass down the language and barely passed down things about our Igorot culture. Finding this site is amazing to me so now I can teach myself how to make these wonderful foods!! To Anonymous, Welcome to OPC, goodluck and happy cooking.